Be the expert with slot terms! 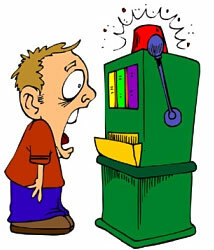 When a player approaches the slots machine and realizes that he\she really doesn't know what "reel", "slot" itself and lots of other important slots terms mean, he\she can be ashamed and this whole unawareness can lead to lots of unpleasant situations, even to the money loss. So, it's much better to be an expert in the slots terms and be on close language with the machine. Read the following slots terms and try to remember them. Thus you'll have the strong slots "slang" reserve with which you are sure to win and hit the highest jackpot! Bonus games: some of the slot combinations can allow a player to have the additional game free of charge. Thus they increase chances to win. Bonus multipliers: such "jackpot slots" can offer a higher winning if a gambler plays the "max coins". Change person: this is the casino employee that can provide change to the players who want to play slots. Comps: a player has a possibility to receive different rewards such as free food, beverages or even souvenirs for participating in the slots competition. Drop Box: this is the container where there are extra coins for the players. Edge: this is the notion that is known also as the "house advantage" and represents the difference between the true slots machine odds and winning payouts of a player. Free Spins: this is the "bonus game" in other words, where a player has a possibility to continue playing when he happens to meet the correspondent combination of the symbols. Jackpot: every player has to know about this notion, because it's the main goal of coming to the casinos. Everybody dreams to hit the top prize of each game. Loose slots: this is the so-called machine which is considered to give out more "land-based" odds of the highest winnings. A player will encounter more of the winning slots combinations there. Multi-line slots: this is the machine that has numerous pay lines. Imagine that video games can have even 15 pay lines. Pay table: this is the menu in the slots machines where a gambler can find out the variety of "dishes" that are served for each day. You will get to know the winning combinations here. Reel: this is the cylinder that keeps the symbols. This is the exact place where each gambler will find the location of the symbols. RNG: Random Number Generator is the exact "Luck" that everybody wants to reach during the game. This is the mechanism that predicts the game outcome, while generating the figures in accordance with symbols. Tight slots: it is considered to be the machine where you'll have fewer chances to win, because of the little number of winning symbol combinations. Wild symbol: this is the symbol which each player can encounter during the game: it has a peculiarity to substitute the ordinary symbols and thus the player can receive the payouts. Slots terms aren't as difficult as they seem! Take some efforts to learn them and you'll see the difference!